Love that comment from a commentator at the current Las Vegas affair (they don't show them talking so it's hard to know which one said it). We suppose a "wishy stroke" is nothing more than a bad putt, brought on by the likes of anxiety. Who says the pros never have any of that (anxiety)? Some day soon, we hope that the golfing world will take full recognition of the relationship between the mind and the body, so that all can move another notch forward with their games and find a new level in understanding who they are and why and how the mind and body work together successfully. That is all for now. We return you to your regularly scheduled trivia. If you are interested to know, give us a shout. Jesper Parnevik, after firing 61-65, was asked about the space between his last win in 2001 and his low scores in the first two rounds at the Valero Texas Open. Rightly or wrongly, after a bit of discussion, he noted that most sports give you a good result if you work harder at them, but golf is the only one that can leave you in worse shape if you work harder. We are inclined to agree with that. Without going into all the reasons, we think what he means is that golfers start making too many changes and thinking too much. Understanding those two elements of the game is critical. Why? Because change within a refined set of physical motions as golf requires needs a lot of time to settle in and become habitual. Continual changing denies that result. Numerous changes really show that the one doing the changing does not have a reasonable grasp on what needs to be accomplished, so the regimen becomes one experiment after another. That will never find the finish line. On the thinking side, if one keeps rattling the brain, simply put, it will rattle the hands, arms, legs and back, not to mention the brain. If you think that's good for your golf, we know a shrink you can visit. Jesper is right. Let's hope he doesn't start making more changes after the first two rounds. In the last two days, we have read or heard several comments about the importance of having good hand-eye coordination for golf. Our question is, "What are they thinking and how are they placing that value on something a blind person can do?" We don't deny that hand-eye coordination, generally speaking, is a good thing, or that it borders on necessity for some sports, like baseball, tennis, hockey and basketball. However, we will steadfastly hold to the view that it is not important, at least not in the sense it gets talked about, for golf. Why? Because the ball is not in motion. All the other named sports have an object that is in motion, which does need hand-eye coordination. But a blind person can hit a golf ball. Clearly, by definition, that player is not in the game, if hand-eye coordination is required. The only reason to "need" it is when one must be able to see the movement in the object s/he wishes to "hit." A golfer can set up, close the eyes, swing the club and make pure contact. For a tennis player or baseball player that would be unlikely if not impossible. Make no mistake. We are neither denying nor downplaying the value of hand-eye coordination, just calling on the gurus to stop telling people it is either important or necessary for golf. Here's a good one for you. Read the headline. Then check out what he really said. HARRISON, N.Y. -- PGA TOUR commissioner Tim Finchem's news conference Wednesday at The Barclays opened with a question about Tiger Woods' decision to skip the first event of the four-tournament FedEx Cup playoffs. "Obviously, I'm disappointed with his decision," Finchem said. "It's not a decision that I like to see him make, candidly, any week of the year, but he doesn't play them all. ... From the standpoint of the sponsor here, the fans in New York, it's certainly a negative. You know, I would like to see it the other way." It is misleading to say the Finchem is disappointed "IN" Tiger. From a news media that is constantly looking for anything that is sensational, or if it is not spicy enough, make it sound that way no matter what the truth is, it is not surprising that they would seek to mislead us into believing that Tiger is a disappointment and that Fichem is upset with him. Reading the article, one can clearly see that is not true. Finchem's disappointment lies in the concern that even though Tiger is a free man, it will likely make a difference in the interest taken in the tournament. After that came another news article (we lost the source) that made it sound like Westchester will now show The Tour the door since Tiger was not there. We don't know if that's true or not, but it certainly is far-fetched, not to mention short-sighted. Our take is that there is no one coming or going that knows Tiger, his needs and desires, better than Tiger. He's who he is and does what he needs to do. And that's that. If others see him as the king of the golf world, without whom the kingdom falls, so be it. Even kings need a vacation once in awhile. Ask any king. The ladies are rockin'. 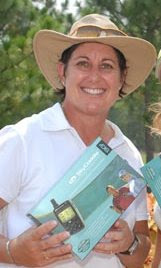 Two weeks ago, Karen Davies, from Scottsdale, AZ won the Tennessee Womens' Open at Bear Trace in Crossville, TN. The runner-up there was Lisa DePaulo from Austin, TX. Yesterday, it was turn about, at Pinehurst, as Lisa won the National LPGA Teaching Division Championship and Karen, the defending champion, was runner-up. They have to be on the classiest list of players out there right now. If that were not enough, last time out, Lisa and Karen teamed up in the LPGA team championship to win that one, as well. We give both of them kudos for their performance and especially for the consistency of their play. They clearly know how to do it. A top notch instructor and friend in Australia sent me a couple of rather formidable questions. "Why is it that people really think they play better with some off the rack stuff that is suited to bugger all people? Why is it that they may score better for a couple of rounds and then the magic wears off?" That's heard a lot, too, isn't it? I wonder if there is a golfer alive who has not had some variation of the experience that prompts the question. New putters used to be my thing. And up until more recently, even Arnie used to haul five or six out to the putting green before playing to see which one would work best that day. We call it the "distraction factor." Anything new requires a different focus of attention from the usual. That takes the mind away from mechanical issues for a moment or two, and that's when things get better. Never mind that it's an unfinished form of the principle. It will work in the short term. The moral is that we could go through golfing life changing our equipment every other day (disregarding the cost, of course) and likely play better until that drained us of money or pleasure. The sad part is that no one bothered to check into the principle lying behind that phenomenon. Most players keep on trying to think about what they are doing while they are doing it - which is a procedure containing several fatal errors. A new piece of equipment stops, or postpones that kind of thinking for a day or two, till the player becomes accustomed to the "new" and it is now "old," so it's back to the same "old" kind of thinking. What makes that "fatal" is the mismatch occuring between thinking and acting. We can think much faster than we can act, which in nature's scheme, inevitably produces either a balk or "hot pursuit" trying to catch up. Either of those is ultimately fatal. Oh, of course, we get away with our misses, even teach people that's a desirable way to go, but it is a "wounded" way to go. So all us clever folks thought up what can now be seen as a "tic-tac" solution - get a new set of clubs. And the rest of the story is, where this message is concerned, it makes no difference if they are "fitted" or just off the rack, since it's not the clubs. Its the NEW in our minds about the clubs. If that's not an elongated way to face a problem, then we've missed something somewhere. We like Woody Austin, or at least we want to. He's a gamer, got grit and can play. If we could watch him from a distance and not have to listen, we'd have him on our short list of very fine players. His interviews this week cleared some things up, at least in our mind. He's got attitude, just like most who play the game. Trouble is, his is a "little" on the over-extended side and he's got it localized down to what looks like a single displacement now, but he still isn't listening to himself. The chip on his shoulder has grown, but he's right about one thing - the media love Tiger more than they like him. In short, the message that comes through is filled with a rather transparent need to knock Tiger off the top rung and a growing resentment that he hasn't done it yet. Or maybe he's waiting for Tiger to step aside and let Woody ascend to the throne. Meanwhile, he's blaming the media and the galleries for their failure to notice and using his verbal "forthrightness" as an excuse, rather than a reason, for why that is. He rightly sees some similarities between himself and Tiger and doesn't understand why the galleries willingly fuss over Tiger and need a challenge from him (Woody) to raise a cheer. It's all in attitude. It's in how a person carries himself. What Woody misses is that Tiger has no persistent chip and his (Woody's) keeps getting bigger and louder. Some have chips that are tough and fleeting and others carry a single one like a piece of baggage everywhere they go. Woody doesn't understand why Tiger can slam a club and be called "competitive," while he (Woody) can show what he believes to be similar and be called a "loose cannon." It's all in the way the attitude is carried. Some call it "bearing." There is a mature version and one that has a lot of unfinished business. It is true that perception can be fickle. It appears to us that sometime back, when Woody hit himself in the head with his own putter and broke it, the "loose cannon" myth got started and that kind of folklore tends to remain. We think it's quite likely that fed Woody's chip. Those things get heavy, so we hope that Woody can now start shifting the load a bit before the President's Cup. He also needs to put aside his "I'm 43 years old" bit and keep playing his game. He thinks it used to be better. We disagree. He's a better player (seems to us its the score that counts) than he used to be. A lot of people didn't like Tiger's fist pumping at first, but it became clear that he didn't carry that everywhere he went. It was fast, short and gone - part of his natural style. Woody needs to see that dynamic, but it is hard to be "unique" when somebody with a better record that he admires and resents at the same time is standing there with all the trophies. Woody is not likely to see this, but we'll hope for him that he loses the chip and puts it where others can't see it. It is time for him to get through this particular "sticking point" and finish his "business." We think he's a winner. Now if only he can see it, too. Winners are as winners do. "Land Sakes, that's no way to do anything!" Sitting here watching, observing, evaluating what is going on at the Firestone course, it suddenly comes to mind that, "Land Sakes, we really don't want golfers to become good enough to play consistently well. It's too much fun to watch them go up and down, try to deal with frustration, hit funky shots and see if they recover and who can do that best." We can feel for a guy who goes from the lead to 6 shots back in two holes, or one that has advertised temper issues that announcers keep mentioning as needing "control," (which of course, those in the know, understand is an impossibility). Emotion cannot be "controlled." The harder you try that, the "worser" it gets. He can learn to manage it if he decides to do that, but..."control"...no way. So maybe we just need to quit trying to help golfers and sit back, relax and watch the circus. It is definitely an 18 holer - circus, that is. (Please note - there is a bit of tongue in cheek - about what we will choose to do). It's just that we've seen shots today that even we could hit! How Lo is Your Hi-Tech? A news headline today in Tennessee reads, "Nuke Plant Fails Siren Test," indicating that only 32 out of 108 sirens associated with the Sequoyah plant worked when tested. But it wasn't the sirens, it was a "repeater" that didn't work. "What has that to do with golf?" you may ask. What it implies... suggests... indicates is that just maybe, we've all become so hi-tech rich that our inventions and equipment have outdistanced our ability and readiness to manage what we have made. Like some of the new clubs out. Do they help players score? Not so you can notice it. Like some of the new training aids. Do they help players score? Not so you can tell it. Golfers do not really appear to be getting better. More people come into the game each year while about the same number leave the game. One wonders if anyone can get the job done effectively. But wait. It gets done once in awhile. Just no consistency. To us that means poor to lousy management. It means that folks are spending more time trying to "control" what they have rather than learning how to manage it. Control will eat your lunch. (Try controlling your emotions and watch them get worse). Management will afford effective results and good management will bring super results, since that comes with direction for assembly and implementation. Only a few will insist that they regularly manage to transfer what they practice to the golf course unimpeded. That's the control game. Sound management will allow you to make the trip. We have Ipods these days that are prime targets for theft and not much knack for preventing theft or a strategy for locating registered items. Meanwhile we have golf ball locators that will help players who haven't learned to manage their games find the balls victimized by trying to "control" their swings. Maybe what we need for golf is something that parallels the "OnStar" system so we can get immediate help for our games that will bail us out of a poor performance. We know that would violate the rules, but it makes the point that we are way behind in our preparation for playing. We may have the swinging down, but not the scoring and that's the part that comes from game management and the ability to play. Better get your mental equipment up to the level of all that other hi-tech stuff if you really want to excel. We can take you there, since we know the hi-tech plan for the mental game and how to implement it. But be assured, it will not sound like the "same old, same old," since that's what has left the residue full of unsolved problems. Try it, you'll like it.